The original Borough of Yeovil, derived from 'The Tenement' of the twenty two messuages of Domesday Book was a relatively tiny part of today's town. The town grew up around St John's church and the boundary of the borough ran along what is now North Lane to Silver Street then followed the Rackle brook towards Vennell's Cross, now the Triangle, continuing along South Street to Hendford then running north as far as Church Lane then turning north again to rejoin North Lane. The borough was bounded on the north and northwest by the Manor of Kingston and to the south and southwest by the Manor of Hendford. In fact the boundary may originally have been slightly larger, encompassing the area bounded by today's Princes Street, North Lane, Church Path and Church Street, since it is believed that the original church was west of today's church. It is thought that the unusual position of today's church, located to one side of the original churchyard area, was possibly caused due to its being built while the original church still stood. The map above shows the extent of the original Borough of Yeovil at left and that same area shown as red relative to today's Yeovil at right. 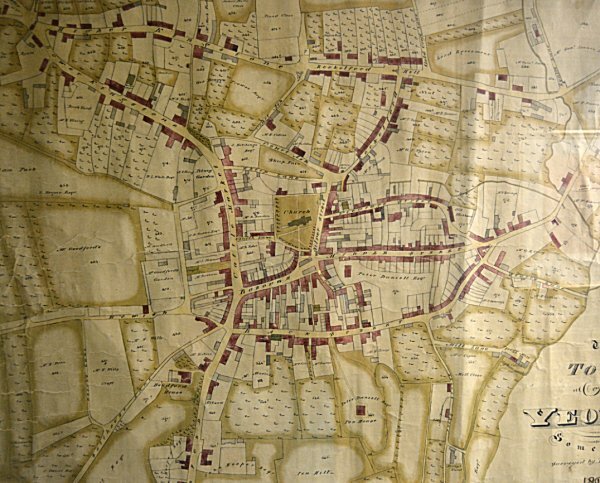 E Watts' map of Yeovil of 1806 shows that the only expansion of the town to this point from the Medieval was primarily along Kingston and Reckleford. This was chiefly because ownership of the lands to the immediate north of St John's church were in private ownership and precluded development. For centuries the size of the town increased very little and occasionally, due to influences such as the plague and a number of devastating fires, actually decreased in size. In 1822 C & J Greenwood, writing in 'Somersetshire Delineated' noted that the town of Yeovil contained "780 inhabited houses and 853 families, 137 of whom are employed in agriculture, 680 in trade, manufacture or handicraft, and 36 not comprised in either class.... The woollen trade formerly flourished here, but the principal manufacture at present is that of gloves, which employs a great proportion of the population." In 1831 the total population of the Hundred of Stone and Yeovil was 3,564 males and 3,869 females, giving a total population of 7,433 persons and Vickery, commenting in 1856, stated that "the number of inhabited houses in 1841 was about 1,441, uninhabited and in building 173." He also noted that the decrease in population from the 1840's to the 1850's "was occasioned chiefly, it is said, by the great depression in the staple trade of the town, in consequence of free trade." Gradually, however, the town slowly expanded into the manors of Kingston and Hendford, especially during the latter part of the eighteenth century as the gloving industry took hold in the town. During the nineteenth century, as the expanding gloving and leather industries meant that the town prospered, it grew even more rapidly. By 1830 it was deemed necessary to officially expand the borough and the 1830 Improvement Act that established the new Improvement Commissioners (see next section) also extended the size of the borough, as seen on the map above. The new boundary ran from Fiveways, along Back, or Higher, Kingston, Reckleford Hill, Lower Reckleford to Townsend Close (at the junction of Reckleford and Sherborne Road), then returning along Sherborne Road to Station Road, then along Gas House Lane to Dodham Brook. It followed the brook as far as Hendford then ran along Horsey Lane, turning along West Hendford, turning again up Salthouse Lane to Huish, then along Huish and today's Westminster Street, turning north into Princes Street and continuing north along Kingston to Fiveways. Yeovil became a municipal borough by Act of Parliament in 1854 and at the same time the borough boundary was extended again due to the increase in the size of the town's population. 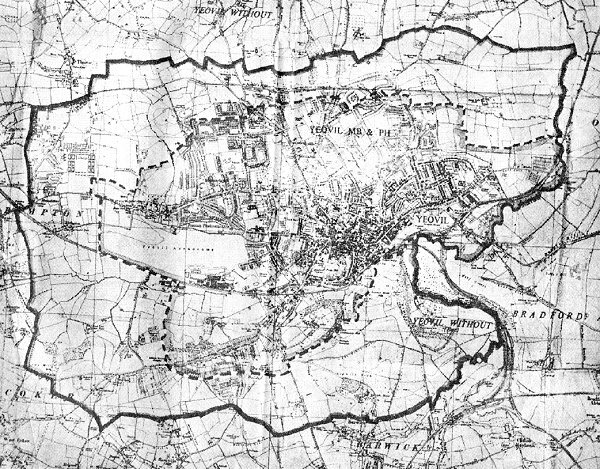 The 1854 boundary extension took in some additional two thousand acres, including Hollands to the north of Fiveways, now the site of Yeovil College, then taking a line roughly down Goldcroft as far as Sparrow Road, then rounding eastwards to encompass the whole of the New Town area across to Mount Pleasant and Sydling's Lane, now Rosebery Avenue. It then ran southeast along Alexandra Road and Victoria Road and then on to the river Yeo at Pen Mill. It followed line of the railway what would shortly skirt Pen Hill to Hendford, then included Hendford Hill and part of the West Coker Road before heading north to join West Hendford. It ran along West Hendford to Beer Street then north to Huish and along Grove Avenue to Preston Road. It snaked west from here to include the Union Workhouse before running back east to rejoin at the Ilchester Road side of Hollands. The map above shows the area encompassed by the 1854 boundary extension coloured white within the pink boundary line, while the areas coloured yellow are the additional areas included by the 1904 boundary extension. The 1904 extension of the municipal boundary added a small section of land to the west of Beer Street and Grove Avenue that today includes Westland Road and Seaton Road. In the east another section of land was included for more housing, including the Camborne Grove area that had already been built by this time. The isolation hospital at the very east of the map above was also brought within the town boundary. The last major expansion of the borough boundary came in 1928 when the town more than doubled in size overnight by absorbing a large area around the West Coker Road and running out westwards to include Houndstone and Preston Plucknett before turning eastwards to include lands to the north of the town as far as Lyde in the east. 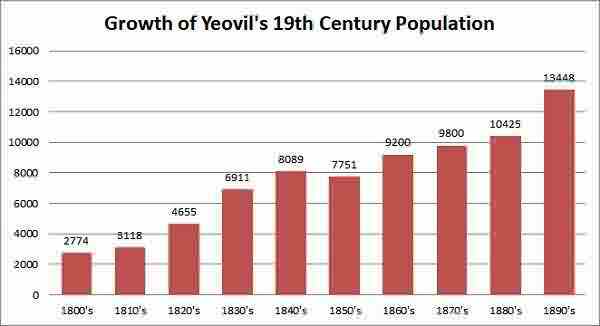 By the time of the 1931 census the population of Yeovil exceeded 19,000. At the time of the 2001 census Yeovil's population was 41,871. This map appeared in the Western Gazette in October 1963 in which it was noted "The Yeovil Town Council are submitting a report to Somerset County Council requesting that parts of the town which extend into Yeovil rural district should be brought within the borough boundary, plus a 'reasonable amount of room for expansion.' 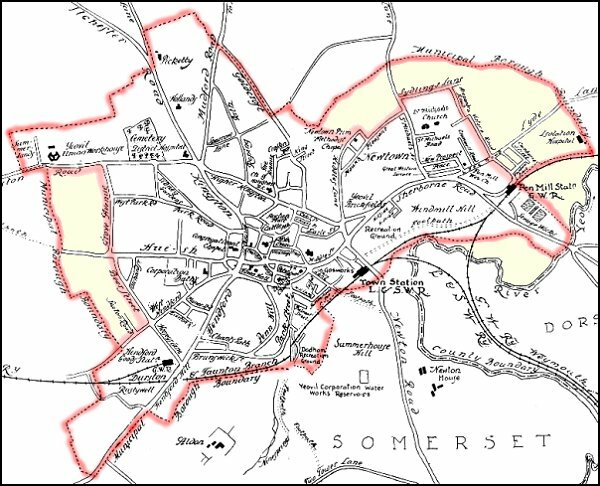 The suggested annexation is of an area varying between a mile and a half mile around the town, except for a small portion to the east, where the Somerset and Dorset boundaries coincide. The present boundary is shown on our map by the dotted line and the proposed boundary by the unbroken line."